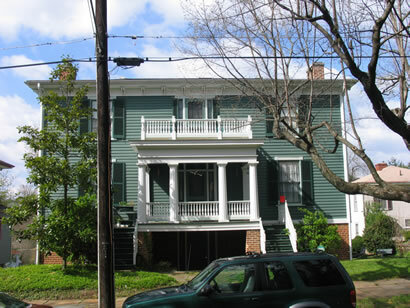 This Greek Revival home was built in 1849. Thomas N. Davis, the city's tax collector, purchased it in 1876 and added the rear wings and the bracketed cornice. The steps connecting the yard to that of 207 Harrison were carved from a single piece of granite and were originally used to board stage coaches at the corner of 9th and Main Streets.